In our apartment, we are using an airbed which is similar to the air mattress. We purchase it at Php2, 500 and it has a warranty for a year. 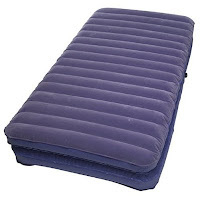 Includes in the set was an air pump where you can fill the air mattress with air or deflate it if you want to keep it in the storage. It also comes with a repair kit if in case there are holes on the mattress. On our case, we always used it since we considered it as our bed. 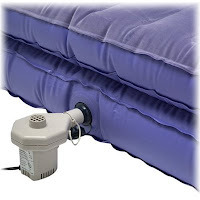 Due to its daily used, we experienced having tiny holes in scattered parts of the air mattress almost every month. Seems it's not a good choice for us. Or it could also mean that the air mattress that we purchased might be of low quality. Regardless, we should've checked some online reviews of air mattresses so we can list down the pros and cons of having one. By December, we are going to purchase a foam mattress. What I'm planning to do is I'm going to send the air mattress to its factory office so they can make a complete overall repair. They told us that it will take weeks before we can get it so that will be the best time to repair it. Then I'm going to store it and save it for other purposes.